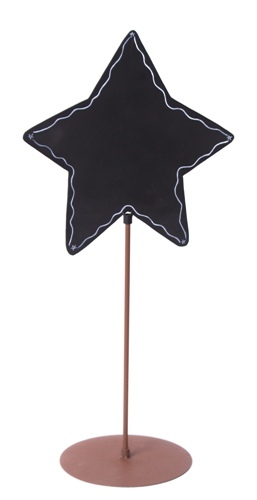 This wonderful Star Chalkboard Sign is a great way to make a statement. Use it in your kitchen to write a patriotic message at your next party or family gathering. Tie a bow beneath the star and personalize it to your theme. This chalkboard star sign is part of the Round Top Collection's Americana line but it can certainly be used all year long. Size: 20.5" x 6" x 9.5"